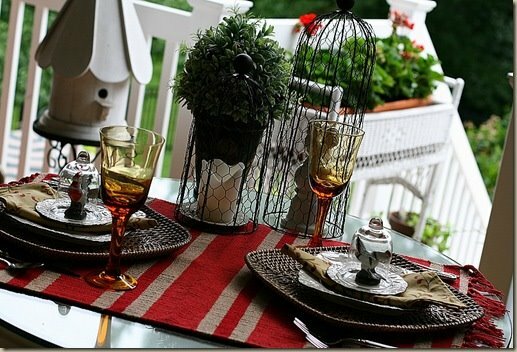 We had our first Cloche Party on 6-18-09 and I ran this post on 6-20. I thought it was so great to see some gorgeous, funny and downright ingenius cloches that you all came up with. So here is the re-run, I hope you will find it as fun as I did and I hope you will giggle at some of the whimsey. 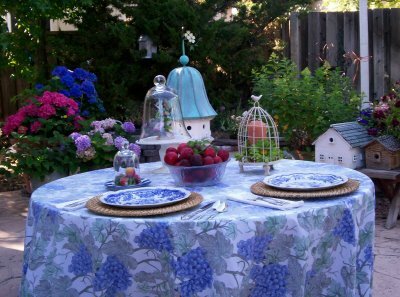 So don't forget, we are having our Summer Cloche Party on 7/24. Get your cloches ready. There is no way I could ever thank all 118 of you enough for joining the "Cloche Party" and making it such a huge success and so much FUN. I tried to see all of your creations and I have been left totally in awe of how creative everyone is. So many beautiful cloches and displays. Some of you said you didn't have a cloche of the standard variety, but boy you sure came thru with tons of different cloches. I've posted just a few pictures of some of the different types of material that cloche forms come in. Please forgive me, I forgot to give each of you credit for these pics, but I do appreciate them all so much. See the pretty little wire one. I love the square bottom on this one. Both of these with the little birds are so pretty. Now she was only kidding, but it just cracked me up. 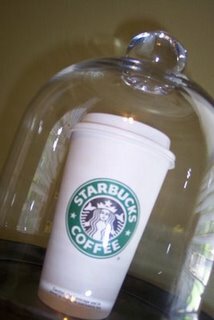 It really is a cloche. Now this is the one I really want. I just need a bigger yard and win the lottery. 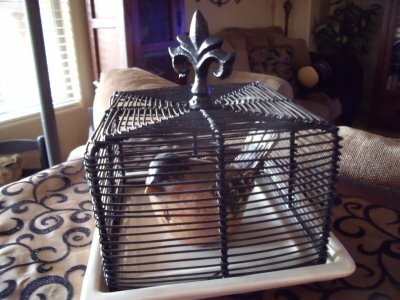 Don't you just love the chicken wire with the crown top. Such fun. Now this is called using what you have and I love it. A wire vase turned upside down. I have never seen so many beautiful shapes before. 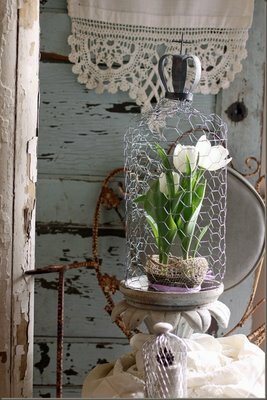 Just look how pretty the chicken wire and glass go together. 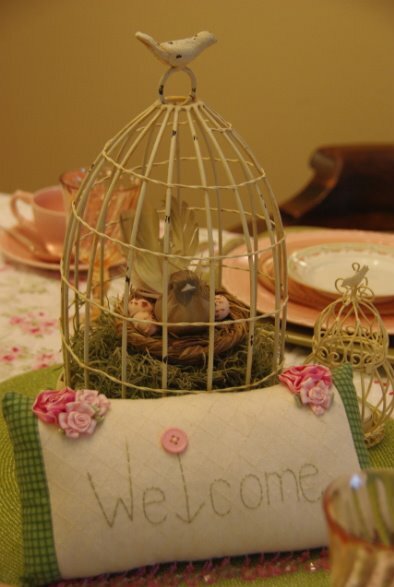 I am so totally fascinated with these pretty chicken wire ones. This iron one is so stately. Pretty shaped iron with the tall finial. So pretty with the little bird on top. I love how open it is too. The scroll work on this one is so lovely. Another gorgeous metal beauty with such a pretty finial on top. Another beautiful wire one used with a sweet little glass one. Weren't you inspired by how creative and funny everyone was. I had a ball and can't wait to see this years cloches, so don't forget, next week is the Summer Cloche Party on 7/24. What great inspiration pictures! 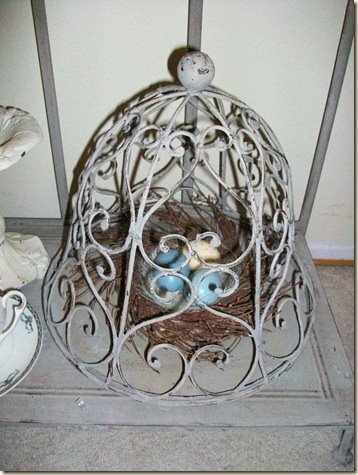 I just love those metal cloches - almost remind me of birdcages. Thanks for hosting! I am loving all the cloches, great inspiration! I am hoping to join you next week, that is if I have my computer working again. Have a lovely week. 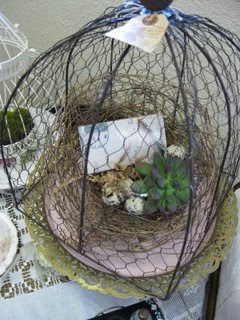 I had to laugh at the creativity of some of those cloches and was inspired by some of the beautiful ones! Can't wait! Thank you for giving me such great inspiration. Happy TTT and have a blissful week ahead. The cloches are all so pretty, Marty! Thanks for being a gracious hostess! Great inspirations for the upcoming party! !....Thanks for hosting Marty...Have a wonderful week! Busy times here, Marty, but I wanted to try to participate in TTT this week and hope to have something for the cloche party. I am also hoping to get back in the groove when we finally get our home on the market. Love the inspiration. Thanks for hosting! Love all these cloche photos! Marty, I can hardly wait for the cloche party. It is one of my favorites! Love all of the photos and some gave me a good laugh. Thanks for hosting. Hi Marty! Oh, I've enjoyed this rerun! We have creative ones in blogland, don't we? Thanks so much for hosting and for dropping by L'Heure Bleue At Home and leaving your kind comment. Marty I hope you don't mind me posting my creative space post. there are several vignettes and things there- was going to do a whole new post but am not finding time these days. 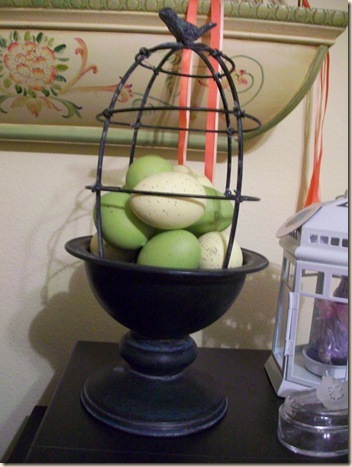 I do hope to get a cloche or 2 done for your party- it was fun seeing a few of my past cloche vignettes in your post! Such fun cloches some of them!! I thank you very much, for hosting and for having me at the great TTT party. I'll be there Marty ~ I just have to figure out what my theme will be. Hmmm. maybe Bentley in a open air cloche with a treatie! Fun ideas, Marty! I'm looking forward to it. I have one or two that I want to change out beforehand; I just need to figure out with what! Marty, it's fun to see all these different examples. Plenty of inspiration here! Thanks for hosting. I can't wait for the cloche party now that I have a real cloche! 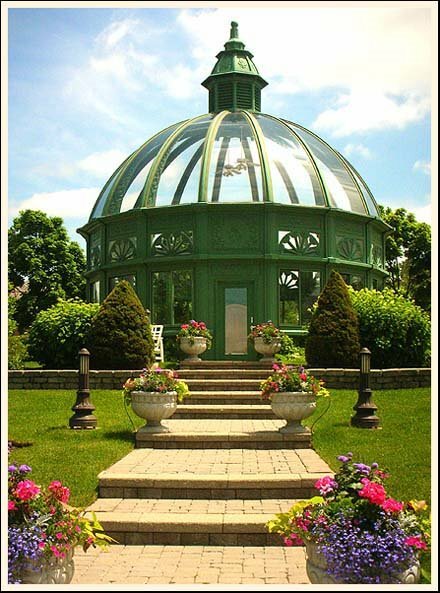 Beautiful cloches you featured. Thank you for hosting your lovely party. I'm so excited about your cloche party! I love it and always get the most amazing ideas! These features are lovely! I always love following these links too- lots of inspiration! Doubt anyone will mind...........maybe I will just redo them for the party next week, if I get the time or creativity!! Thanks for hosting as always, you do a fine job. Hi Marty, thanks for hosting and giving us so much inspiration for your cloche party. I love your new Nissan Versa. I have a Nissan Juke and I love it!! Thank you for hosting a wonderful weekly linky party! Looking forward to your annual Cloche party too- fun to see all the past ones, some so fun and clever! I do like cloche's a lot too! I hope I remember to join your party! There are some adorable ones from your previous post! This is inspirational and motivating! I have never seen so many beautiful cloches. Gorgeous. Thank you for hosting Marty!! Thanks for hosting your party, Marty! My entry has nothing to do with tabletops...hope you don't mind...at least I'm not the only one breaking the rules. Hey, congrats on your pretty pillow being featured at Boogieboard Cottage's Metamorphosis Monday Favorites. What imagination! That was a great idea for a party. Thanks for hosting such a fun party! Lots of inspiration, here! Hello! I saw your awesome party at At The Picket Fence. Thanks for hosting! I hope you could come by and visit my link party happening every Friday! Hi Marty: Thank you for hosting the party today--it's my first time participating. 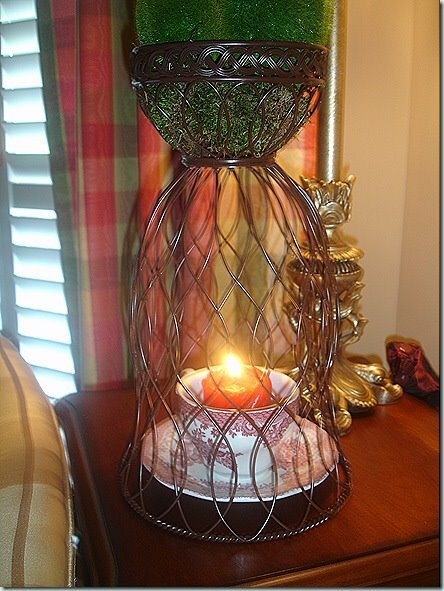 I love the cloches you featured, especially the wire ones--now I'm going to have to try to make one! Take care--have a lovely week! Love all the beautiful cloches!! Thanks so much for hosting TTT and Thank You for stopping by Plum Perfect and leaving me such a sweet comment! Have a wonderful night!